It’s been over a year since my last post. It’s been a big year in my life. On the plus side for Fractal Domains development, I retired from my day job at the end of 2011. On the minus side (for Fractal Domains development), my wife quickly came up with a project that required some programming skills and was intriguing and allowed me to learn some new things (and also paid money). 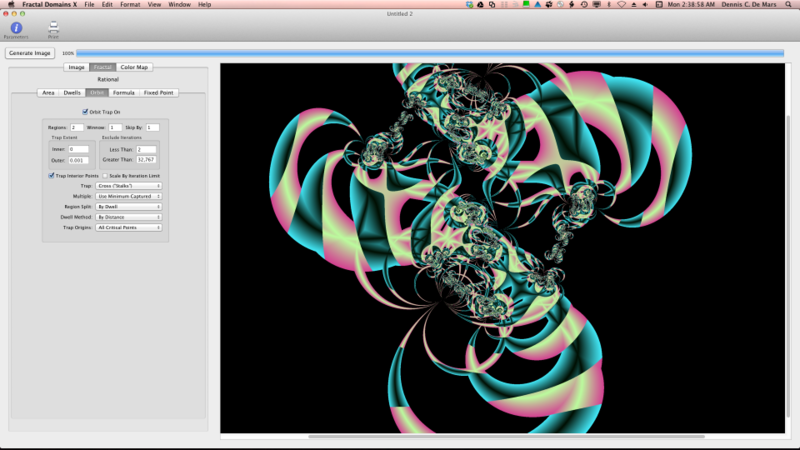 That, unfortunately, brought the development of Fractal Domains X to a virtual halt for most of 2012. However, since November I’ve had an opportunity to put a lot more time into the plan I described in my last post. I’ll go into it more in some future posts, but a brief summary would be: I now have a Cocoa application that can read all of the Fractal Domains files I have on hand and can display them accurately. A lot more has to be done on the interface. I have a parameter editor that is pretty much a clone of the old one; I have yet to implement an interface to enter polynomials for rational fractals. and I haven’t implemented a color map editor. In both cases, I don’t want to clone what I did before, but instead introduce interfaces that will be an advance on the previous versions. When I get these interfaces done I will have an alpha version available so that I can find out if there are any flaws in the ability to read legacy files. I would like to fix all such bugs before I proceed further.